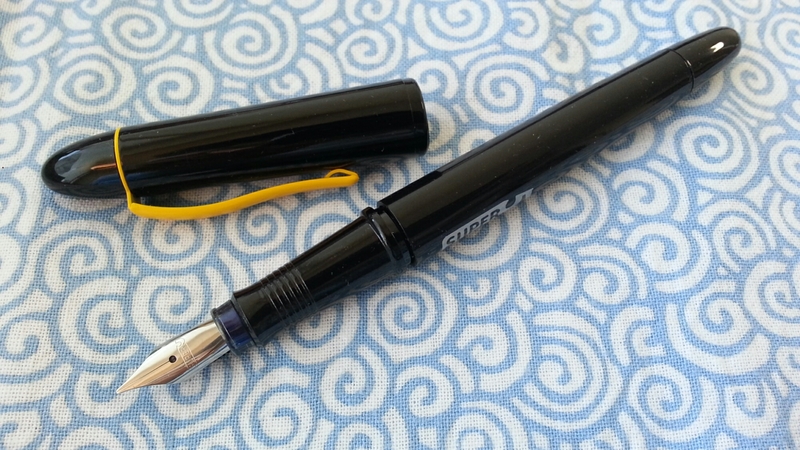 Here is a very interesting fountain pen I got to know about through another pencil blog: the Super5. It’s still fairly new and there aren’t many reviews of it online so I hope this helps. When I saw this on Lexikaliker it was still only available in Europe, and I didn’t feel like going out of my way to get hold of one. It looked interesting, but in the end it was a €20 pen, and with some experience you know what to expect in that price range: light plastic body, plain steel nib (tips hit-or-miss quality-wise), OK for indiscriminate use of colored inks but generally not destined to be your favorite. But recently Goulet Pens started carrying it stateside at $27.99, and I was tempted. And what a pleasant surprise it has turned out to be! For an inexpensive pen it has some unusual features. First, the grip section is coated metal, not plastic. I’ve seen plenty of pens that were all plastic (except for the nib of course), all metal or plastic-gripped with metal body and cap, but I don’t think I’ve seen a metal-gripped pen with a plastic body and cap up till now. Its weight firmly anchors the pen in your hand, and because it’s coated it’s less slippery than other metal-gripped pens. It also means that the part connecting to/puncturing the converter or cartridge is metal and therefore (probably) more durable. The plastic surface of the barrel and cap is treated in a way that makes it feel more like a Montblanc than a Preppy (Gunther says it uses piano lacquer). The difference in material is what I like best about this pen and what really sets it apart from other pens. It can’t have been easy finding room to maneuver within this price range, but the people behind this pen seem to have really given it some thought, and I like the way they’ve tried to come up with something different, and offer something of real value. This is why I can forgive them for the clip, which looks… umm… spray-painted(?!) but that’s OK. You’ve got to cut costs somewhere. 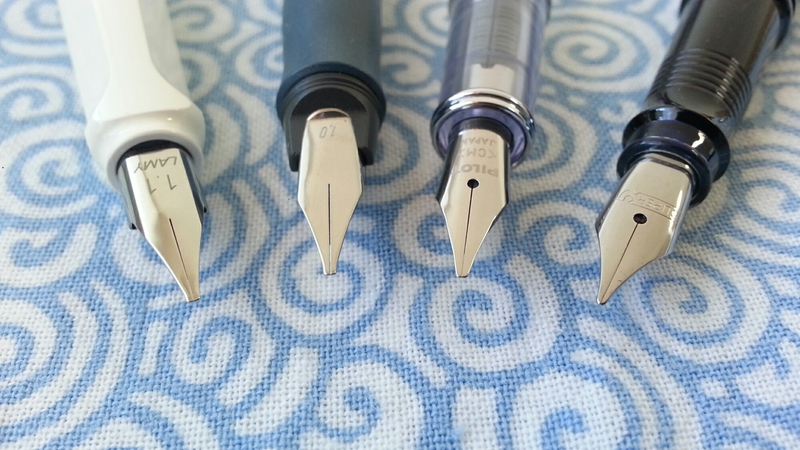 In contrast to the body, I found the nib pretty average. With hard steel nibs like these it’s more about quality control (weeding out the bad ones) than adding any special features that matter I think, and the nib I got didn’t have any problems, so that was a good sign. The promos make a big deal out of how unique the 0.5mm calligraphy nib is, but the reality is that the calligraphic effect (the contrast between thick vertical lines and thin horizontal lines) is not that noticeable. It shouldn’t be, actually, considering that 0.5mm is the thickness of the average M nib or even the mechanical pencil, and there is a limit to how thin the nib plate can be hammered out – this is the reason most calligraphy nibs start out at 1mm. The nib right now has some slight drying and flow issues, but the flow could improve with time. Don’t get me wrong, it writes fine without skipping or drying out, it’s just that it doesn’t write quite this wet as in this video, where you can almost see the ink pooling behind the tip, or produce lines that thick. 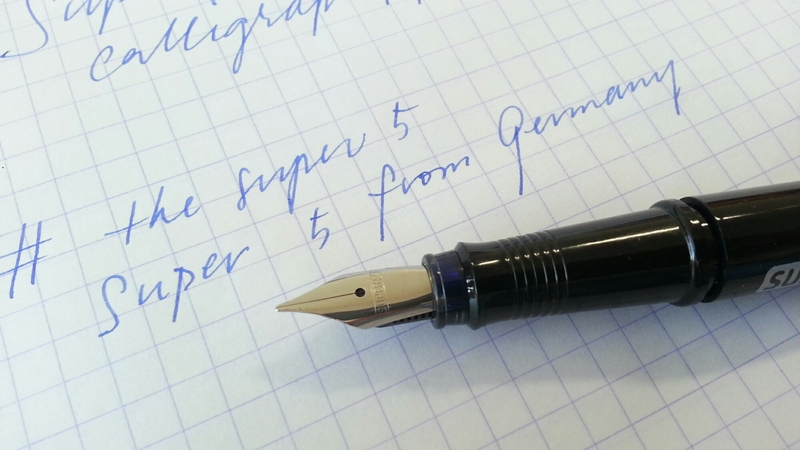 However, if you don’t think of the Super5 as a calligraphy pen but just as a normal everyday fountain pen, the 0.5mm tip gives your handwriting just a little bit more of line variation. It looks prettier. You won’t get tired of it like a calligraphy pen, you can use it every day in journals and planners. 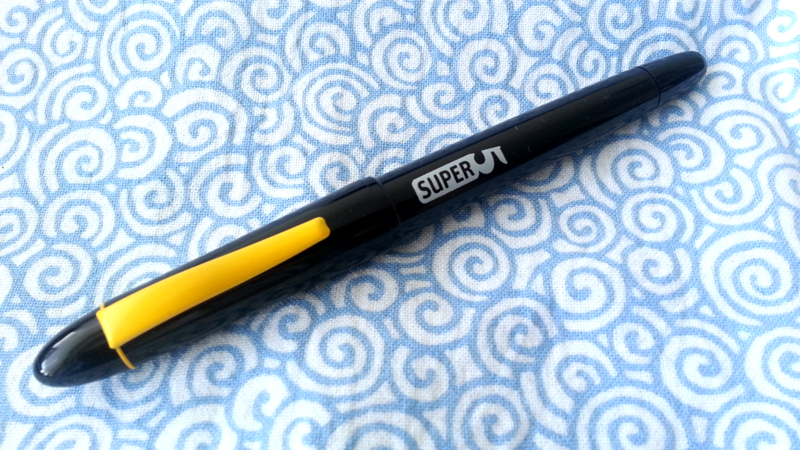 Conclusion: the Super5 is a very interesting and well-made pen and a standout in its category. I hope to see more from whoever is making this!